I watched the landing of the newest Mars rover Curiosity last night. It was fun being a part—if just an observer—of this event, and I was moved not only by the accomplishment (amazing! ), but by the emotion in the room. It will be exciting to see how this mission unfolds over the next 2+ years. And how about this? I had said to my family that there would be no pictures of the landing vehicle, since there are no cameras in this area of Mars. But I was wrong! 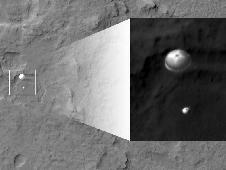 The HiRISE camera on the Mars Reconnaissance orbiter snapped a picture of it with chute deployed. Incredible.